The Brothers of Alpha Gamma Rho’s Pi Chapter are men of honor, rooted in loyalty, stewards of their community and builders of tomorrow. Historically, they are men who take time to humbly honor their roots, see the value in deep bonds forged with a handshake, and balance a noble sense of ‘doing good’ with hard work, superior ethics and an unshakable value system. In short, they embody the characteristics of true gentlemen. Today, the Pi Chapter continues that time-honored legacy of producing extraordinary men who make up the Brotherhood of Alpha Gamma Rho. Undergraduate brothers and alumni have worked together and made sacrifices to preserve the chapter’s legacy and invest in its future. And today, that Brotherhood boldly moves forward with a far-reaching vision to not only ensure our future, but also assure that it’s a future is built upon the success of those who came before us. 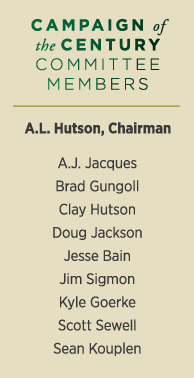 As we move toward a watershed moment in our chapter’s history in 2021 - our 100th anniversary - this significant touchstone creates pause to reflect on the foundation of excellence built at the hands of our Brothers and the responsibility that lies in perpetuating excellence for another 100 years. Chapter leadership believes the Pi Family supports not only this question, but its ideal. And this belief provides the very foundation for construction of a new fraternal home. 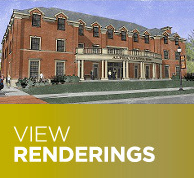 The construction of new fraternity house will serve as a visual representation of our chapter providing increased space, amenities, growth and offerings essential to ensuring our fellow Brothers are housed in a space that not only meets their needs, but fosters self-improvement in an enhanced living and learning environment. 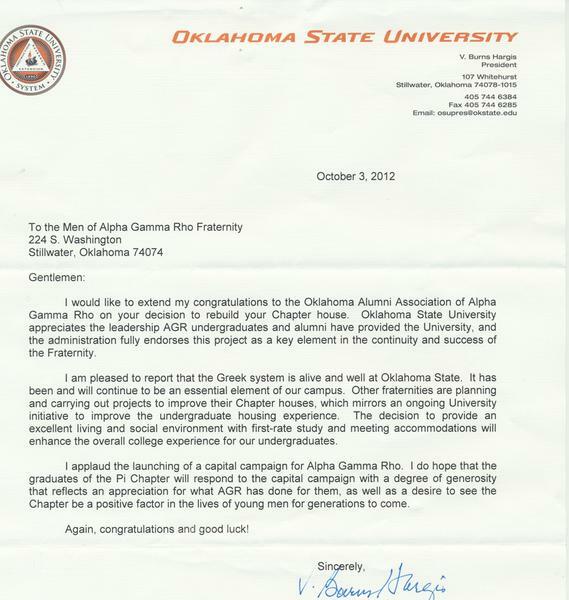 For each year we remain in the current facility, our Brotherhood loses competitive ground in attracting young men who excel in academics, leadership, athletics and campus activities at Oklahoma State University - an institution where these AGR qualities have reigned supreme for nearly our entire tenure on campus. This is a moment nearly a century in the making. It is a moment to seize history and play a role in creating the future. The time is now. By choosing to move forward together as a family, as united Brothers, we choose to make an investment for life. We are family; men who rally to support their lifelong Brothers. Pi Chapter has invested in generations of men, and now is the time to invest in those who have yet to enter our walls. To extend our walls, we must first build them. Join us.